Diigo has an extra level of social networking that Delicious does not provide – at least not in a usable manner. You can connect with people that have similar interests based on what you tag. Delicious, an original web 2.0 company, still has “user-generated” as its core raison d’être. Diigo has the later-stage web 2.0 philosophy of being a “social network”. 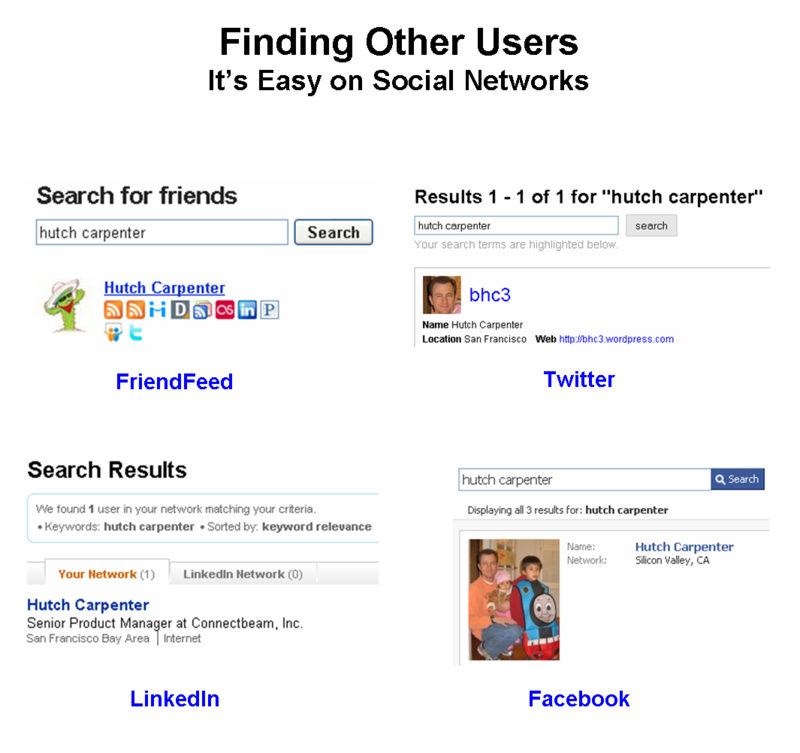 Social networks make finding users easy. So does Diigo. Delicious doesn’t. Diigo attempts to match you to others based on common bookmarks and tags. As the graphic below shows, it’s not exactly Toluu-like in its matching. Levels of compatibility at 2% and 3% don’t quite inspire clicks for further investigation. 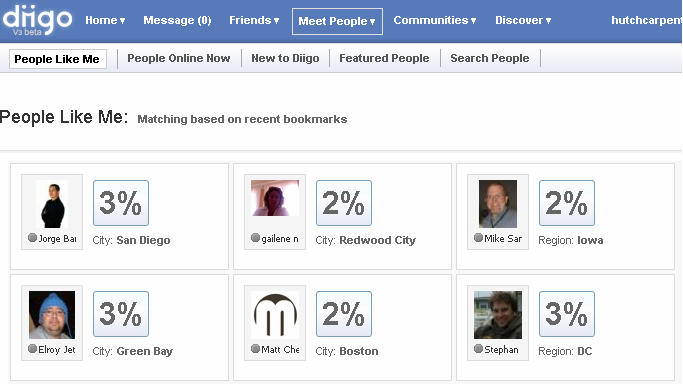 Social recommendations are a work-in-progress at Diigo. Delicious doesn’t do recommendations. So when you check out others who bookmarked something you like, you can quickly determine if they are someone to whom you want to subscribe. Delicious also lets you look at someone’s activity, but you have to click on their handle to see their page. There’s no profile provided on the list of users who bookmarked a link. Who visited my profile? Potential matches. Also lets you know when your social network paid your bookmarks a visit. Commenting. Commenting enables discussion with others. Socializing. Bookmark sharing. You can call out specific users with whom to share a bookmark. Very social. But Delicious pretty much stops there on the social aspects. The rest of Delicious is centered around bringing order to the huge volume of crowdsourced bookmarks. Delicious: Who Bookmarked That Link When? That timeline is a thing of beauty. Users, dates, tags, notes. Where Diigo wants to get you socializing around a bookmark, Delicious wants to provide you with information about how a link fared with the public at large. As mentioned above in the Diigo user profile section, Delicious doesn’t provide user profiles in this listing. 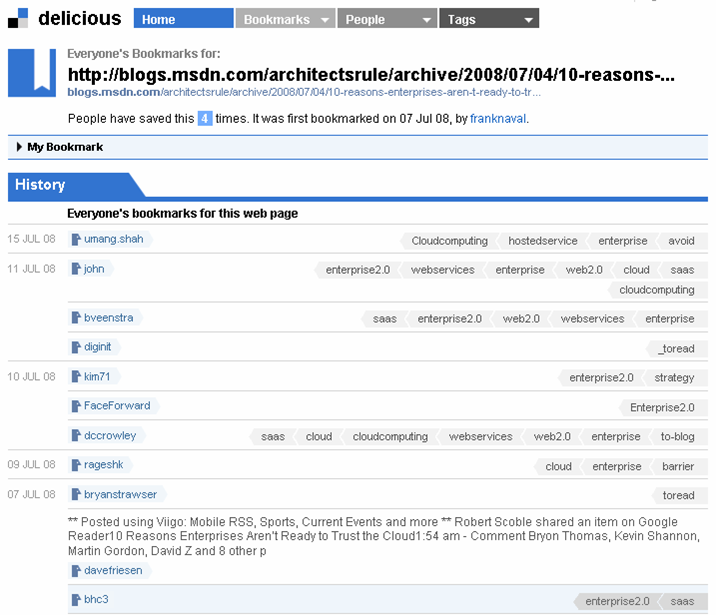 The new Delicious continues its mission of organizing a massive number of user-generated bookmarks and tags. It looks cleaner, and I like the way information is presented. Information organized by an army of user librarians. “Social” in this context means your bookmarks and tags are exposed to others, and you can find related content based on what others are bookmarking and tagging. People are the basis for discovering content. Diigo wants people to interact via common interests in content. It has a lot of social network hooks. “Social” in this context means establishing and building relationships with others. Content is the basis for finding people. On Wednesday August 13, I start my new job as Senior Product Manager for Connectbeam. Connectbeam provides social bookmarking and networking to the enterprise. The goal is to foster better information management and discovery, and to connect colleagues around projects and common interests. Connectbeam’s architecture and core application (Spotlight) were designed to help people in any role, across the enterprise, connect with both the growing pool of information and colleagues with the expertise and experience to help them get their jobs done more intelligently and more quickly. We enable this by aggregating the social metadata that is generated naturally by using the web into a single repository that everyone in the company can access and use. Current customers include: Procter & Gamble, CSC, Bristol-Myers Squibb, Honeywell, 3M, Intel, Pfizer and Booz Allen Hamilton. Social Media Consumption: You Want Signal or Discovery? I also like Connectbeam’s delivery model. I am a fan of cloud computing, and in my experiences at eFinance and Pay By Touch, customers got comfortable. But I also ran into companies that only wanted applications behind their firewall, which is what we sold at BEA Systems. Security, control and reliability are still important, and recent outages at Amazon S3 and Gmail highlight those concerns. Connectbeam runs as an appliance behind companies’ firewalls. Connectbeam delivers its model as an integration with existing search engines and other applications. For instance, Connectbeam now has an integration with Microsoft’s SharePoint, the most pervasive collaboration software out there. The Microsoft SharePoint Senior Technical PM even tweeted about it. I’m a big believer in the ability of enterprises to improve the ways that information is created, disseminated and managed by employees. Those that get this right will be better-positioned in our information-centric economy. I joined BEA Systems to do product marketing for enterprise 2.0. Prior to that, I had done a little tweeting and had a Facebook profile. But not a whole lot of social media. I started blogging in February to eat my own dog food when I was marketing web 2.0 to companies. I needed to immerse myself in the world to really understand it. Well, blogging has become quite important for me. FriendFeed has become just as important. FriendFeed opened my eyes to the possibilities of knowledge as the basis of relationships. The ways in which content from a variety of sources is a powerful, addictive basis for learning, conversations and collaboration. How activity streams are compelling reads. I’ve been active on FriendFeed since March, and it shocks me how much I know about web 2.0 and technology in general versus last year. I’ve still got much to learn, and FriendFeed will continue to be a good source for that. So why can’t companies get better around that too? Having eaten my own dog food on FriendFeed, I’m ready to work with employees and companies to improve the ways in which information is created, tracked and shared. You’ve probably seen more than a few posts saying that today’s resume is your Google search results. Your social network sites, content, updates, what others say about you…all of it is searchable. Like me, Connectbeam CEO Puneet Gupta subscribes to Google Alerts for “enterprise 2.0”. Well one of my blog posts was listed in an alert. It caught Puneet’s attention, so he read the blog a bit more. Liking what he saw, he then investigated my name out on the web. Among the sites he found was one where I was a recommended blogger to follow (thanks Daryl, Franklin, Louis, Mark, Mike, Rob, Steven). Those recommendations were in part made due to the wonderful effects FriendFeed has for bloggers. Would love to connect with you and discuss some ideas. I reached out to him, did some interviews, and the rest is history. The new job will give me a more structured basis for looking at the ways in which information is managed. I plan to look more deeply at some of the consumer social bookmarking sites.I’m a product manager for Connectbeam, but a lot of my job will involve product marketing too. I expect working in this area will influence my blogging subjects some. But I’ll blog about other fun stuff along the way as well. Gotta go – my commute is from San Francisco to Mountain View. Need to battle the 101 traffic.